Fox Norton, who joined Colin Tizzard's yard from Neil Mulholland recently after being sold to Ann and Alan Potts, was a highly impressive winner of the Shloer Chase. Ridden by Aidan Coleman, the six-year-old went off at odds of 5/2 and won by nine lengths from Simply Ned. Tizzard said: "I'm delighted and slightly embarrassed. This is all down to Neil Mulholland. We just put him in the system for a fortnight and have done nothing with him. He's just a very good horse. That's what we were hoping we were buying, and we can see that already. "We saw him here at the last meeting when he absolutely coasted up, and again on level weights today with these good horses and he's done the same. He's a beautiful young horse. He just travelled and jumped." When told that his horses are in particularly good form at present, Tizzard said: "I can't take any credit for this one because I've only had him a fortnight, but the rest have been running fantastic. There are obviously a few reversals all the time, but if it stays like this all season we'll be very happy." 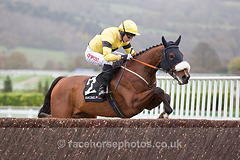 Asked about plans for Fox Norton, Tizzard replied: "The Tingle Creek is where they normally go, horses like him. Two-milers you can run a bit more often than three and a half miles, but that's what we'll do - the Tingle Creek [at Sandown in December]." Simonsig, trained by Nicky Henderson and ridden by Barry Geraghty, broke a leg during the race. He was immediately attended to by vets but unfortunately could not be saved and was humanely put down. 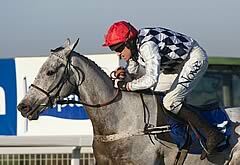 The grey 10-year-old, who won the Racing Post Arkle Chase at The Festival in 2013, fell at the third fence. Henderson said: "It was a hind leg (injury). I thought he was all right when he got up. I can't get this right. You have tears in every single way. "You all know what the game is like. It tests us, and it is one of those things. "I've been saying for the last two weeks I would not have worked Sprinter Sacre with him. He has been working too well for Sprinter Sacre. "They used to go together but he (Sprinter) would not have been able to go with this horse. I thought I got him back. "Ronnie (Bartlett, owner) adores the horse. The last three months he had not missed one day. "It (Sprinter Sacre's retirement) was not a funeral, but a celebration of life, but now we've got the funeral and the tears all of a sudden go the other way. "It is not fair for the team more than anything." Coleman was full of praise for the winner after the race and revealed the victory was as straightforward as it appeared. "He was very good - very straightforward," said the jockey. "It was as it looked really - he was very good. I'd love to be able to tell you some secrets or something like that but he just jumped and travelled brilliantly. It was a thoroughly enjoyable experience. He's definitely one for the big two mile races now - you could have said that before this race. When they step up in grade, you never know, but Noel Fehily and Richard Johnson, who have ridden him before, have been very helpful so there have been a lot of people involved in this horse in the past and now it's time for Colin (Tizzard - trainer) and his team to take him forward. It's very exciting."